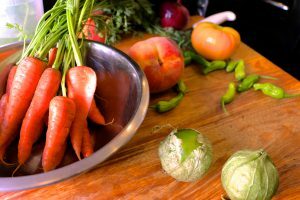 So you want to cook like a restaurant chef, but not quite sure how to go about it? 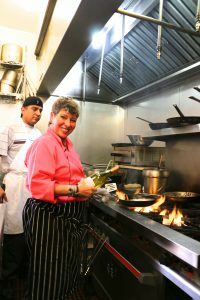 Enter Catherine O’Brien, executive chef and co-owner of TerraCotta Wine Bistro near the Georgia O’Keeffe museum in Santa Fe. If you can keep up with this funny, feisty, flavor-driven woman, she might tell you something like this: keep your recipes simple, use locally sourced ingredients whenever possible and be sure to mix it all up with a heavy dose of stories and food memories. 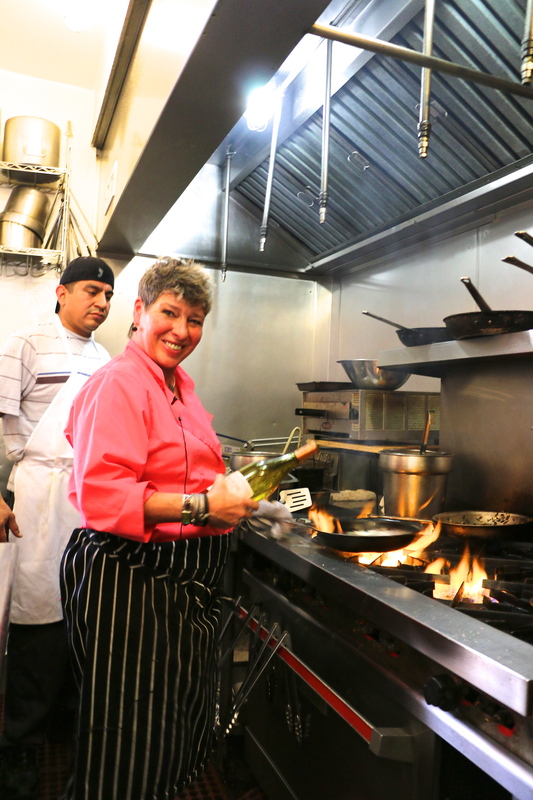 Chef Catherine O’Brien at her stove at TerraCotta Wine Bistro. She cooks food that reminds her of the best parts of life. That’s a recipe that seems to work well for O’Brien. It also helps that she was trained at Johnson & Wales University in Providence, R.I., and was corporate chef at Smithsonian’s Air and Space Museum. But beyond training and experience, a big part of what makes O’Brien a wizard in the kitchen is her deep connection to her Southern roots. Food-related memories come flooding back to O’Brien like the tide at sunset: beach walks with her father, catching nets full of blue crab, surfcasting for trout, pulling in sand sharks that would later become dinner and unforgettable biscuits and gravy made by their housekeeper. O’Brien breathes life and humor into these stories as she impersonates her mother and father in full Southern drawl, evoking the people, time and place that have had a lasting imprint on her culinary identity. What does all of this storytelling have to do with food and TerraCotta? For O’Brien, the answer is everything – food is life, life is food and both are good. Is there barbecue? You bet, flavored with moonshine. Is there bacon? Yes, indeed, right along with farmers’ market kale and tricolored organic carrots. Are there hints of Asian, New Mexican and French? Check, check, check. TerraCotta offers a brightly colored tableau for lunch through dinner service. It has been open for more than two years, but O’Brien and her business partner and best friend, Glenda Griswold, have been cooking up a storm since they arrived in Santa Fe in 1994. “We went to Denver on a whim, and while we were there we thought we would just come to Santa Fe for a weekend. Then we cried looking at the sunsets. Six months later we were like Thelma and Louise,” says O’Brien, referring to a road adventure 1990s film. O’Brien and Griswold are also co-owners of the successful Peas ‘n’ Pod Catering and Catie’s Bodacious Barbecue. Griswold takes care of the front-of-house and shopping and O’Brien manages the kitchen. That’s a lot of planning, purchasing and pugnacious cookery, but these two have a nearly compulsive desire to make people happy with food. “I want the bistro to be a happy, casual place filled with life, love and laughter. You know, where you can wear shorts, come in if you just went hiking and share a plate if you want,” O’Brien says. 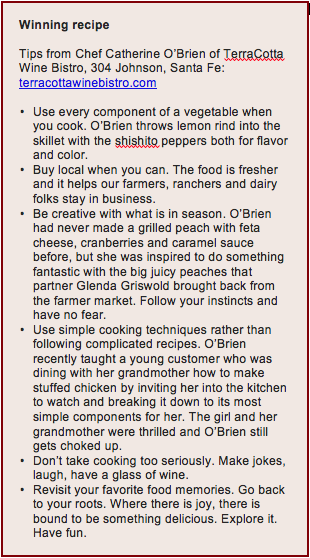 To keep the food as flavorful as her personality, O’Brien sources a great deal of food locally. Their beef comes from a variety of New Mexico producers such as the Navajo Nation Native American Beef Program; Heritage Ranch, a distributor of beef from seven New Mexico ranches; and Padres Mesa Ranch near Gallup. TerraCotta also purchases cheddar, white sharp cheddar and feta cheese from Tucumcari Mountain Cheese Factory Inc. And Griswold is a regular shopper at the Santa Fe Farmers’ Market and supports a number of local family farms. Fresh produce from local farmers’ markets keeps food seasonally fresh at TerraCotta Wine Bistro in Santa Fe. Create these tasty greens with whatever looks good at the farmers’ market — kale, turnip greens or chard. They’re great served alongside fish, meat or on their own. Sauté onions, carrots and greens for about 1 hour on medium heat in olive oil. Add the vinegar, sugar, hot sauce, salt and pepper. Continue to simmer and adjust the seasonings as you like, more hot or more sweet. Chef Catherine adds a healthy dose of roasted garlic and lemon juice to the simple pleasure of blistered shishito peppers. Shishito peppers are mostly mild, though sometimes they have a bit of heat. Roast garlic in olive oil (see below). Set aside. Add olive oil to hot cast-iron pan and sear peppers for 3-4 minutes, until blistered. Season with salt, pepper, garlic and juice of two lemons. 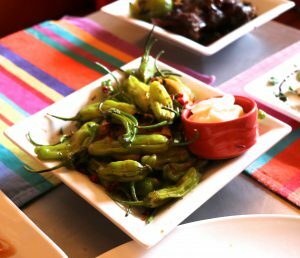 Roasted garlic and lemon juice enhance the simple pleasure of blistered shishito peppers, a slightly sweet, slightly spicy blend of flavor. It will keep up to two weeks in the refrigerator. Line a rimmed baking sheet with parchment paper, silicon mat or foil. Spread the garlic in a single layer on top of the baking sheet and drizzle with just enough oil so that each clove is coated. Lightly season the garlic with kosher salt. Bake the garlic for 45-60 minutes, gently shaking the pan half way through. The garlic cloves are finished roasting when they are fork tender and golden brown. Add the garlic to an airtight container or jar. Fill the container with olive oil and store in the refrigerator. Mash garlic and salt in small bowl until paste forms. Whisk in mayonnaise, olive oil and lemon juice. Season to taste with coarse salt and pepper. Can be made 1 day ahead. Cover and chill.